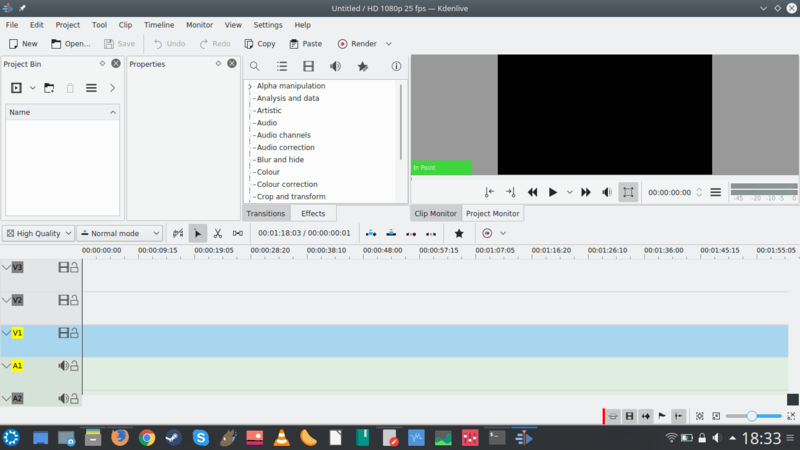 Kdenlive is my video editor de jour since the dawn of civilization, or rather, as far back as my video editing attempts go. 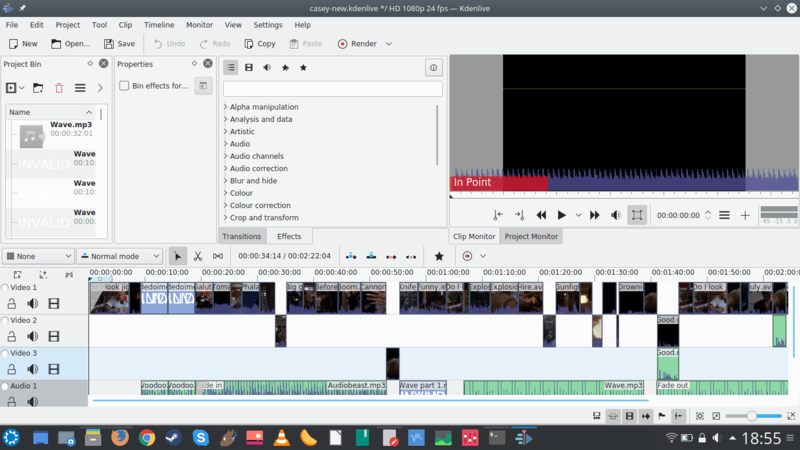 Pretty much all of the clips I uploaded to my Youtube channel were made using Kdenlive, with only some extra work in other programs. 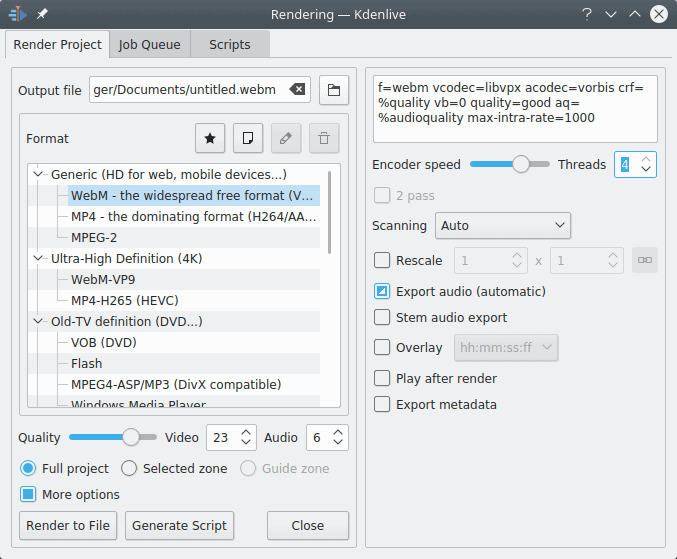 Kdenlive is powerful, flexible, useful, and now there’s a new beta that promises many good things and delights. The 18.08 version can be found under the label Refactoring Branch – sounds like an avantguard field of mathematics – and it is distributed as a self-contained AppImage, meaning you just need to make the file executable and then run it (single- or double-click). Which is exactly what I did. Follow me. The first few minutes were a bit odd. 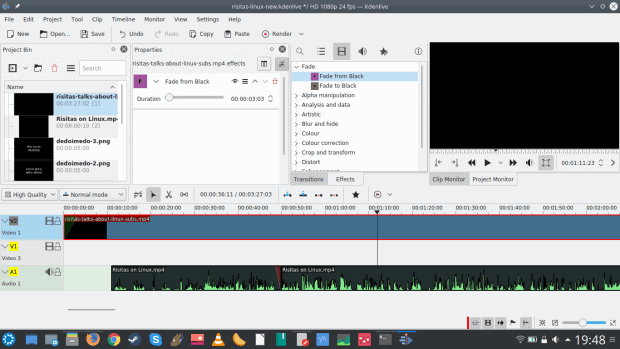 Kdenlive kept asking me about color theme changes, and this requires a restart. I’m not sure why or how, but it felt odd. By default, the program uses a dark theme, similar to what we’ve seen with Krita and GIMP recently. 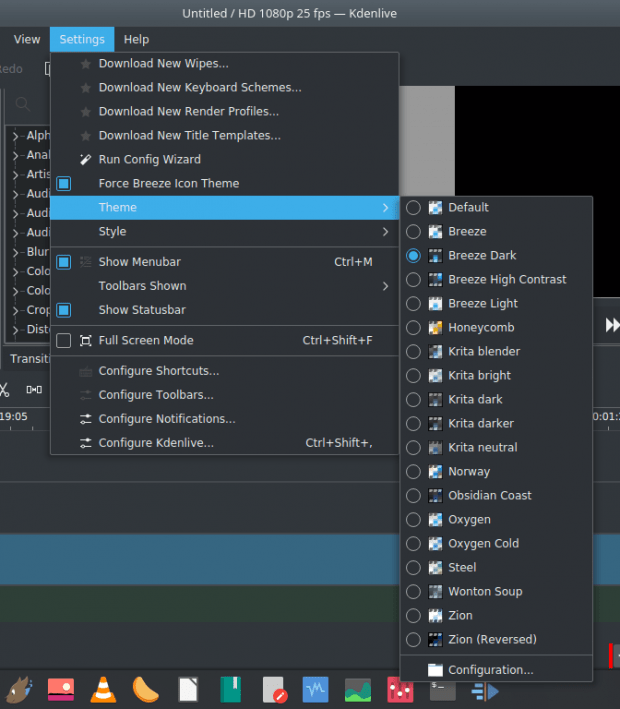 I find this less optimal, both because I find dark themes harder on the eye, and also because my desktop uses a light theme, so I’d expect the program to launch with something that matches the desktop setup. Much like Krita, you have the option to change this easily. Which I did, and I was asked to restart the program again. Kdenlive re-launched, and my theme change was not preserved. Next time, I simply did not restart the program, kept it running for a while, and when I did eventually launch it again, the light theme remained in place. My next step was to import an existing project – fully aware that this Beta may corrupt kdenlive project files created in older versions – so I could actually start playing and testing. I didn’t want to just go through the UI for the sake of it, I wanted a real-life scenario. I grabbed several of my bundles, including my Under Siege remix and my Risitas & Firefox parody. 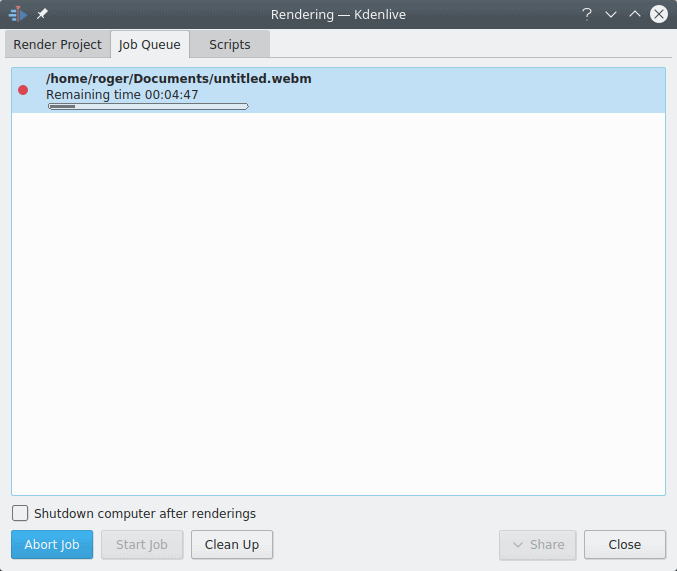 With the former, Kdenlive 18.08 had trouble loading the project file correctly. First, it complained about the language locale (my test laptop didn’t have the specific locale installed, which was used on the machine where the project was originally created). This sounds more alarming than it is. Second, it created an automatic backup of my original project, which is good, so even if something goes bust, you have the backup to fall back to – well, most of the time, as this didn’t quite always work. Two out of three, I guess. Not all project file upgrades and backups worked seamlessly. 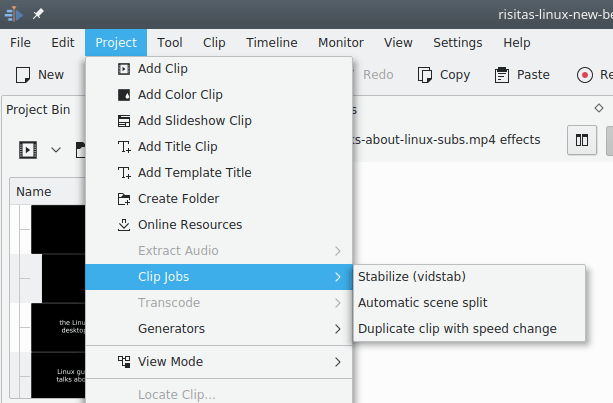 Third, it complained about missing clips – project files have hard-coded references to hard disk locations for clips used in the final render, but you can skip those or recursively search for them. 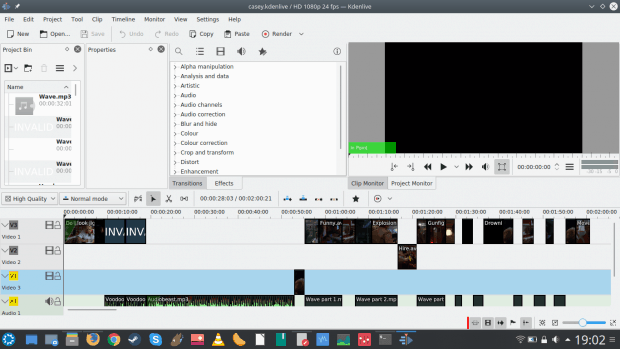 Fourth, and most importantly, Kdenlive Beta did not display video and audio tracks correctly. They were there, just invisible. Playing the project preview rendered nothing. Wondering if something was wrong with my project, I downloaded the non-beta Kdenlive 18.04 and opened the file there. The project showed up without any problems (save a few missing clips due to disk paths, but that’s trivial). 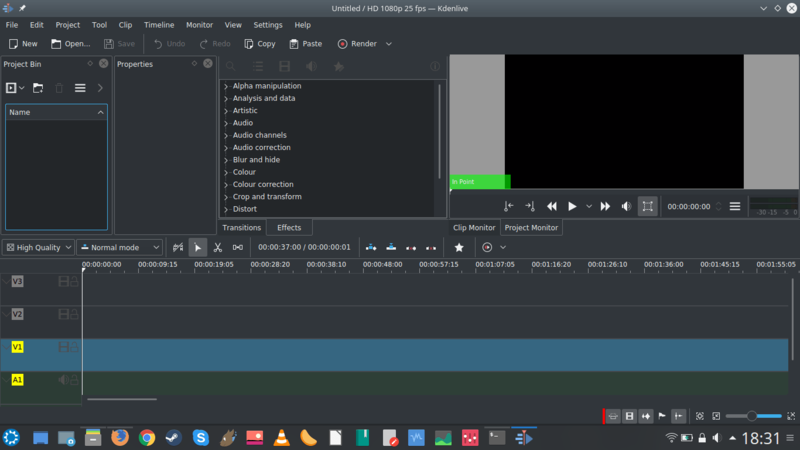 Kdenlive 18.04 loaded the “complex” project without any issues. No matter what I did, 18.08 would not properly load this particular project. Eventually I was able to load an older, smaller version of the project (which had half the clips missing and wasn’t really render ready). Large project loaded (eventually) with errors – missing clips; it never displayed fully and correctly. I had more luck with the Risitas & Firefox project. 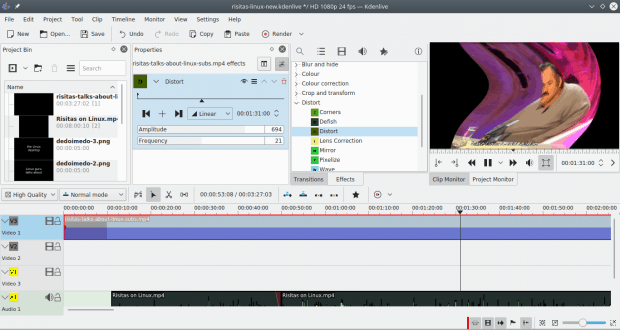 It is a smaller and less complex creation, with only a single clip across the entire video track (with embedded subtitles) and no sound, and a second identical clip used as an audio source, plus the opening and closing credits – single images displayed for a few seconds with some basic fade transitions. Even here, though, it wasn’t all perfect. I had to load the project a couple of times before it was showing correctly. 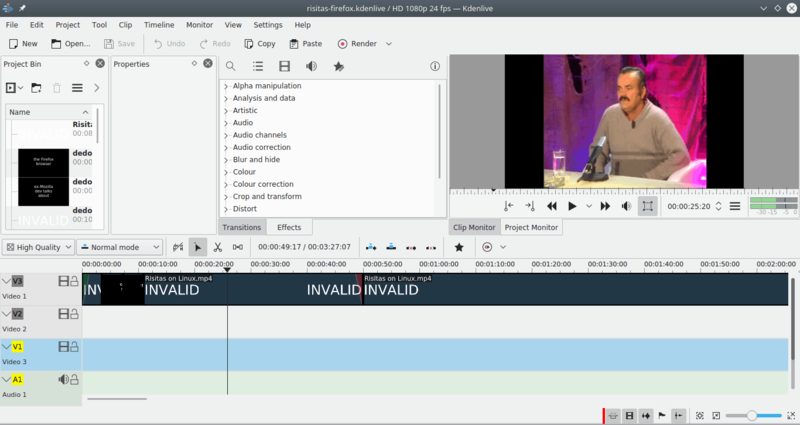 Once, the program had the word INVALID placed over clips that were actually there and NOT missing from my project folder. I was able to play the content, see the preview, everything, so this is a bogus message. The watermark INVALID is bogus here, as the clips are there, and the project plays just fine. Eventually I had my project ready. Now, it was time to start playing. Small project loaded just fine (eventually). I didn’t explore this in too much detail. I’m not sure about how symbols and dev packages fit into the world of AppImage containers, and I also didn’t want to spend too much time troubleshooting these errors. 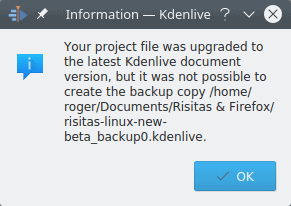 Kdenlive crashes are not a new thing. In fact, over the years, pretty much every single version of the program would occasionally segfault itself. The frequency of the issue was bigger with this beta, but it wasn’t exclusive or surprising. The one promising thing is that the auto-recovery functionality seems to work reasonably well. Then, I settled into the familiar rhythm. Barring the crashes, errors and hiccups – some of these purely beta, some of these quintessentially Kdenlive, I was able to make quick, easy progress. The UI has not dramatically changed, so you won’t feel like blazing new, frustrating ground. Most of it makes sense. The plethora of goodies is there – you can add markers and guides, you can use the razor to splice tracks, use the spacer tool, and you also have the option to paste not just clips but effects as well, so this should save time. For Kdenlive veterans, this is old school stuff. In a way, like most plugins frameworks across the wider Linux world, this is somewhat broken. You get a lot of effects, but they don’t quite work as you expect. One, there’s a difference between what you get through the UI file menu (Timeline) and what you have in the embedded dock. Some effects were showing in the former, but not in the mater. It turns out, the dock does some basic validity checks, and if the effect is corrupt, it won’t show, whereas the Timeline menu will, but if you try to apply them, nothing will happen. Speed is a good example – unless, it can be applied as a right-click option to the tracks but not through the dock and the Timeline option is broken, which makes it the most convoluted way of doing things. But I doubt that was the intention, and I don’t think the effect and the track option are the same thing – speed control is a new and unrelated improvement in this version. 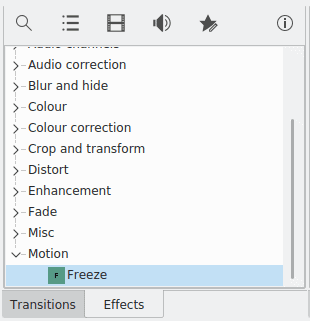 Discrepancy: Speed effect shows under the Motion section if you access the effects via Timeline in the file menu. Discrepancy: Motion speed effect does not show in the list in the embedded dock. 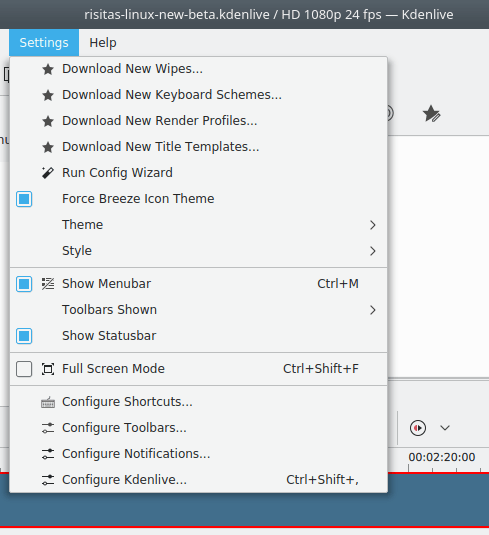 Two, you can download new effects – this didn’t work at all, somewhat reminiscent of my attempts to grab visual add-ons for the Plasma desktop, with broken themes, icons and similar. I had the same situation here. 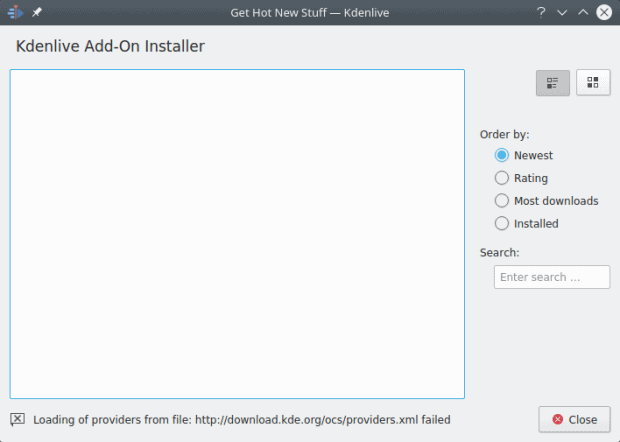 Download of new elements failed spectacularly. Three, some of the effects would supposedly be applied, but they did nothing, sometimes Kdenlive crashed as a consequence (segfault and such), and sometimes, even though the effects were supposedly correctly applied, things went wrong as a consequence. Cartoon would blot out half the playback. Charcoal looks nice, but then the audio is gone. You don’t have an option to type in actual values, and you need to use the mouse to scroll up and down. This is, in my opinion, a functional regression compared to older versions of Kdenlive. It is faster and more precise just to write down how long you want effects or transitions to last. Some effects supposedly work but you don’t see any change. Some effects work, but they also cause bugs – this one caused the project audio to go mute. Some effects work just fine, like the distort effect. Not all effects and filters are bundled in one place. There are lots of extras scattered through the program menu, I guess a legacy of development over many years, something this refactored branch does not solve on its own. 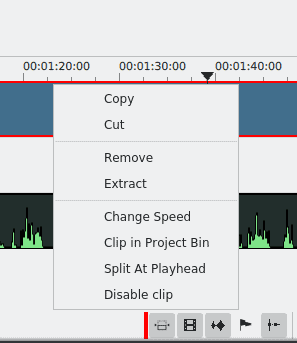 You can generate content, like noise or counter, and you can also do all sorts of “clip jobs” – and these don’t count toward your effects list. I think everything should be bundled together, and the logical hierarchy improved. Generated counter added to the track. Clip jobs are like effects, only not quite. Most importantly, on the track itself – in previous versions, you could right-click and apply any which effect, and I’d always do it this way, as it’s faster. Not so anymore. The right-click context only offers a small subset of function, albeit some rather useful ones. This might change as beta goes prod, I guess. Now, this is an interesting one. Some great improvements and some issues. When setting up, you don’t get exact numeric fields like before, where you could type in the bitrate for video and audio. Instead, you get this scale, but it doesn’t really mean much (what’s video 23 and audio 6 quality, for instance). Editing render profiles is currently disabled. 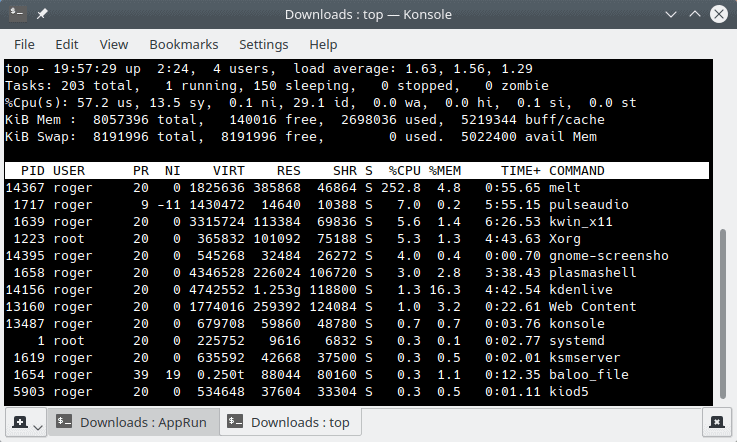 Now, if you go multi-threaded, it works! 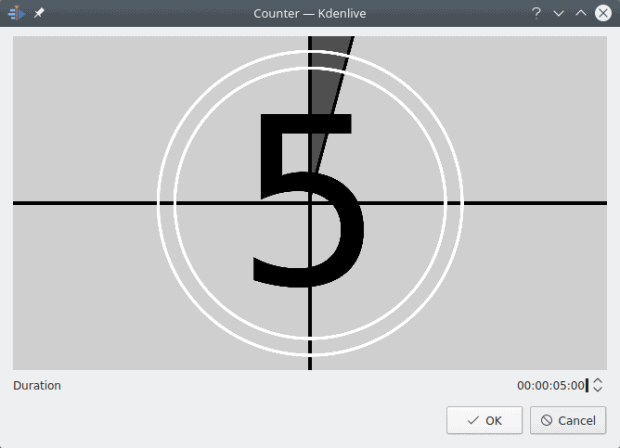 In the past, Kdenlive struggled with using more than a single core. It would usually stay capped at 100% CPU (one core), and if you tried to use more than that, it’d often leak memory until the system froze, or it would crash after a while. In 18.08, the functionality finally does what it’s supposed to. I had the melt process utilize 250% CPU, and while this does not map to four cores, it was still roughly 2.5x faster than what you get with a single threat. Nice. The render was successful, too, which feels like a miracle after all the crashes earlier. At the moment, the new render wizard does not allow you to input precise numerical values for your desired AV bitrate, and you cannot edit selected render profiles – but you can use multiple threads and it works just fine. The sharing button is disabled at the moment (might be a beta thing). There were a few other niggles. Sometimes, the Project Monitor would only show a black screen and not play the file. 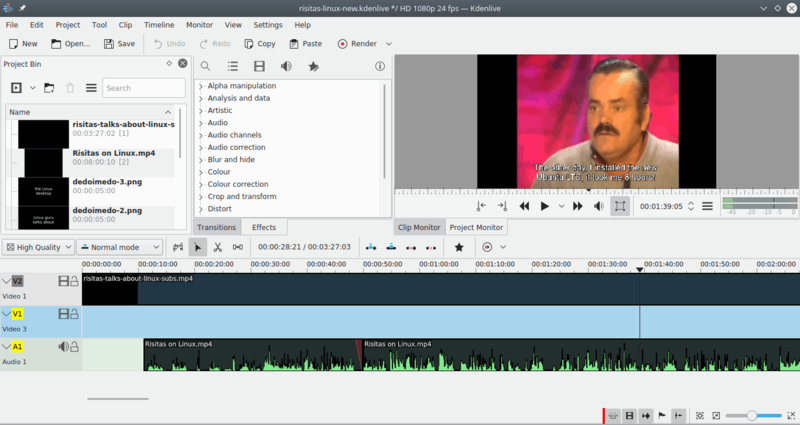 Sometimes, it would take a few seconds for Kdenlive to catch up and show the correct content in there, plus effects. You do get a rather nasty audio distortion when playing and pausing the track now and then. [h264 @ 0x7f01ec683e60] A non-intra slice in an IDR NAL unit. 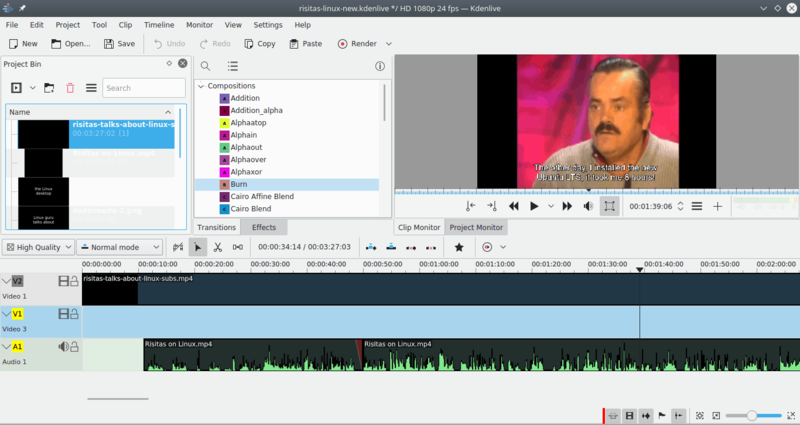 There is still NO support for subtitles – this is something that would greatly enhance Kdenlive. Lastly, the UI with its plethora of docked elements does look cramped on smaller screens. One may argue that you should not be doing video editing on a laptop or screens smaller than 24 inches and resolution of 1080p, but then, if the program can run on these smaller devices, there should be a way to dynamically rearrange the UI. This can only help users. 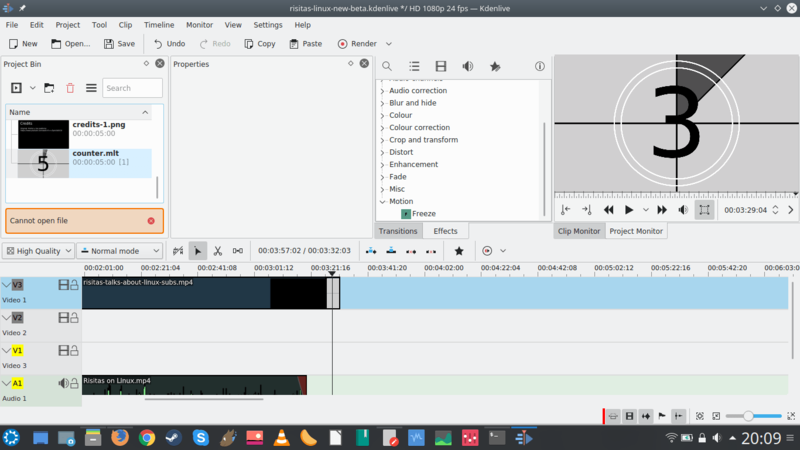 Kdenlive 18.08 Beta seems to be a natural continuation of this video editor. I’m not sure about the bold statement on refactoring, because I don’t know how it comes to bear on the end user. From my perspective, the UI remains largely unchanged, with some bugs and oddities. You get the dark theme, no numerical fields, some chaos around where effects, jobs and generators should be placed, discrepancy between different lists, and a separate track right-click behavior. The big problem is, it’s not stable yet – not enough. The crashes are too frequent, and loading old files is a hit-and-miss game of chance. Then, even if you do successfully load an older project, nothing guarantees it will work as you expect. I would like to see immense, visible improvements in this space. Kdenlive needs to be stable like a rock. On the other hand, rendering is a pleasant surprise, and you do get much better multi-threaded support than in the past. All in all, this beta is exactly what the name says – a moving target, rife with bugs and problems. 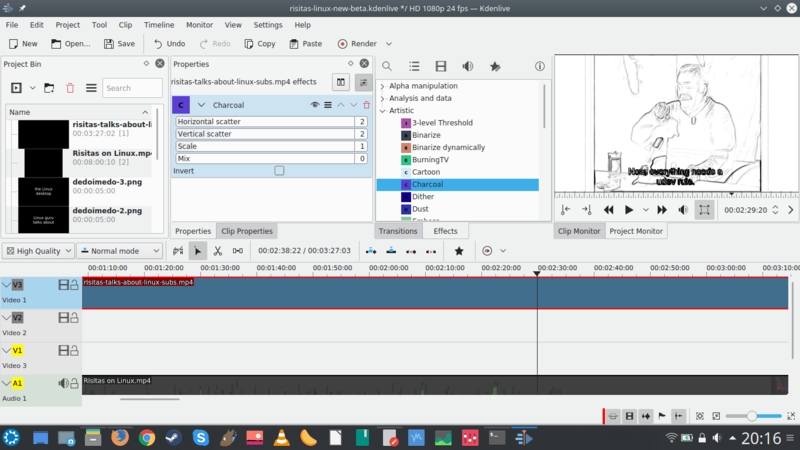 There’s a lot more Kdenlive can do, with primary focus on UI consistency and stability, making sure the effects all do as intended, and then slowly adding and improving features. The release date is soon, so this is am ambitions and aggressive expectation, but hopefully, we shall see all that neatly wrapped in the official version. Anyway, this will remain my video editor de jour, I see no reason not to like 18.08, I just want it to be robust and elegant, and allow me to continue doing my non-funny videos as I’ve been doing for many years. Take care. O.T. 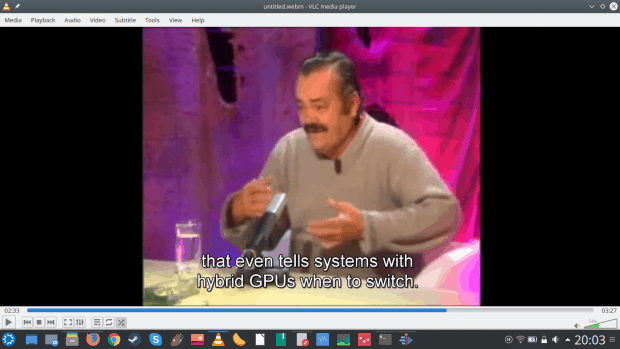 I always read, with pleasure, your articles, and I appreciated your suggestion for web based application used by Manjaro. In these days I read a presentation of Peppermint os, that uses a lot of these web apps and has a tool called ice that allows to create them in a few clicks. 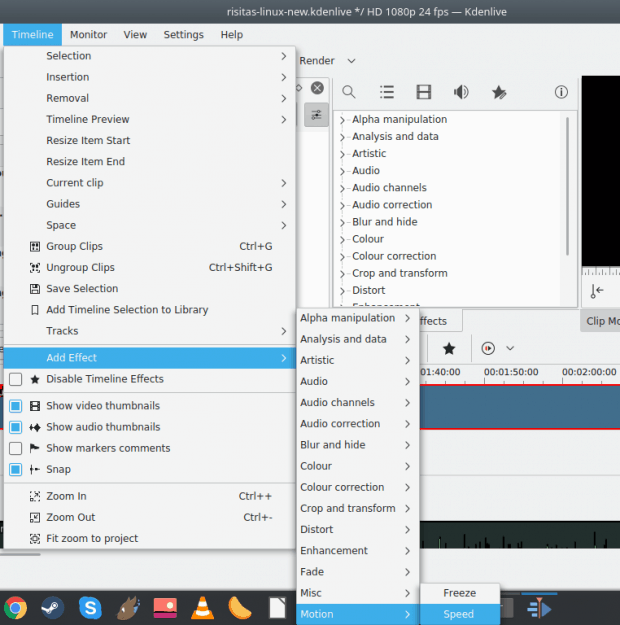 Somewhere I read it needs to have installed chomium but I think it is not more necessary, it works perfectly in Kubuntu.